Stay fashionable and cruelty-free wearing vegan casual and dress boots from our Amazon-curated collection. We've contacted all of the companies that make these boots to ensure they are all completely free of any animal-derived materials. What are “vegan” dress and casual boots/booties? Vegan boots are simply boots (sturdy footwear that covers the foot, the ankle, and sometimes the leg below the knee), that are made without animal-derived materials and by-products. If none of the dyes, materials or adhesives used for the boots are tested on animals, then they are also considered cruelty-free. What materials are used to make women’s vegan boots? 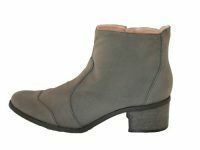 Please Note: Some vegan boots/booties made from PVC and EVA can be recycled, or are made using recycled materials. 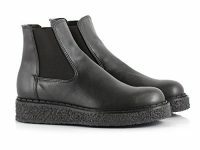 What styles of vegan boots exist? 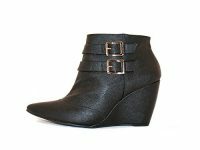 Why buy boots/booties that are vegan? 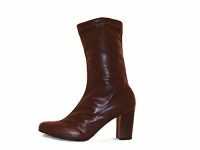 Every conceivable style and colour of casual and dress boots and booties can be made without the use of leather, suede, sheep skin or any other animal materials and by-products. Vegan and cruelty-free boots can pull off the same look, feel and function as those that are made from animal-derived materials. Does buying one pair of vegan boots really make a difference? Yes, and it’s actually a very effective form of animal activism! Here’s how it works; by purchasing vegan boots/booties (or any other ‘vegan’ product) you’re telling retailers, manufacturers, distributors and designers that there’s demand for animal-friendly footwear… and demand creates supply. 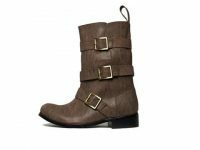 The more vegan boots leaving shelves, the more leather and other such pairs left sitting on shelves. This lets companies know that the demand for cruelty-derived products is shrinking; with less demand for animal-derived products, less will be made. As a bonus, showing your new vegan boots off to friends, family and other people in your circle of influence will cause even more demand for these boots! Just like leather and other animal skin-based boots, prices can vary from one model of boot to the next based on differences in materials used to make them, different manufacturing processes employed, and different brand names attached to them. As a result, some vegan boots/booties are quite affordable, whereas others are quite expensive; most pairs fall somewhere in between. Should I get rid of any non-vegan boots that I already own? This is a fairly controversial topic, and one that's very hotly debated. Regardless of what anyone says, it’s up to you to decide what to do with your old, non-vegan boots; only you can decide what you can afford, and what you’re comfortable with. Some options are to give them away or donate them, or you can keep wearing them until they’ve fallen apart or otherwise outlived their usefulness. Whatever you do, try your best to not just simply send them to a landfill if you or someone else can still make use of them. What companies make vegan boots? We keep a list of women’s footwear companies that we find by way of social media, word of mouth, by Google searches and by other methods, whose entire catalogue seems to be vegan and cruelty-free. We contact these companies to check that they don’t use any animal-derived materials or by-products in the making of their boots and any other footwear they produce. If we’re convinced their goods are suitable for vegans, and they're listed on Amazon, then we display anything of theirs we can find. Do you list vegan boots from non-vegan companies? Yes, but it depends on the pair. If we have a hard time getting straight and consistent answers from non-vegan companies with regard to which of their boots/booties are suitable for vegans, we won’t list that company’s products. Before we list anything on this site, we have to be 100% sure that it’s vegan & cruelty-free. Found this page helpful? Check out similar product categories to learn more! If you or your employer makes vegan casual or dress boots, or any vegan product for that matter, we’d love to feature those products on our site... for free! Contact us at - info(at)getitvegan(dot)com - to find out more!